The Opposite Of A TV Show “Jumping The Shark” Is? Which Classic Board Game Is Still Quite Difficult For Computers to Excel At? In popular culture, the phrase “jumping the shark” refers to a point in the trajectory of a television show where the show writers run out of ideas and, in an effort to take the show in a new direction or introduce fresh material, do something that signals to the audience that they’re actually out of ideas and the show is in decline. The term comes from an episode of Happy Days in which Fonzie literally jumps a shark on water skis (wearing swim trunks and his trademark leather jacket, no less). Like all things, however, there’s a corollary to jumping the shark, a point where instead of getting worse, a show gets better. The term for this turnabout moment is called “growing the beard”. If Fonzie jumped the shark, then who grew the beard? 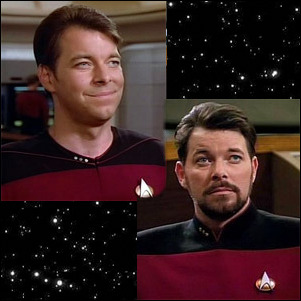 None other than Jonathan Frakes in his role as Commander William T. Riker on Star Trek: The Next Generation. Frakes grew the beard at the beginning of Season 2 and that beard growth coincided with a significant increase in the quality of the series. Perhaps it was just the actors settling into a comfortable relationship with each other, perhaps it was fresh writing, or maybe, just maybe, Jonathan Frakes’ beard is inherently imbued with thespian-boosting properties that radiated an aura of blessing over the cast. Regardless, magic beard or not, the change was pronounced enough that the phrase “growing the beard” took hold and decades later, it’s still enmeshed in popular culture.